UTOPIA (pict. 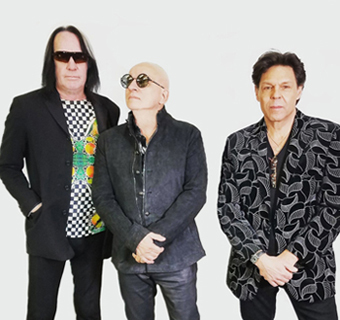 l-r): Todd Rundgren, Willie Wilcox and Kasim Sulton. Rundgren has recently reunited with his band Utopia for a North American concert tour, which is their first in 32 years. Based on strong demand from fans, Rundgren reunited with bassist Kasim Sulton and drummer Willie Wilcox to present a new show that features the band’s key songs from their years together. The band has also released a limited edition, 7-disc boxed set, The Road To Utopia: The Complete Recordings (1974-1982). The Utopia reunion tour is the latest project for Rundgren, who continues to record solo albums and collaborate with other artists. His most recent solo album is White Knight (released in 2017), that features collaborations with Daryl Hall, Donald Fagen, Joe Walsh, Robyn, Trent Reznor & Atticus Ross, Bettye LaVette and Joe Satriani. We are pleased to do this new Q&A interview with Rundgren. But before we get started, here’s a list of his hit singles, solo albums, albums with Utopia, and classic albums he has produced for other artists. Rundgren’s best known hit songs are “Hello It’s Me,” “I Saw The Light,” “We Gotta Get You a Woman,” “Can We Still Be Friends” and “Set Me Free.” He also wrote the Top 10 hit “Love Is The Answer,” which was originally recorded by Utopia and was later recorded pop duo England Dan & John Ford Coley. Rundgren has recorded a remarkable 27 albums as a solo artist, plus 10 albums with Utopia. His best known solo albums are Something/Anything?, A Wizard, a True Star, Todd, Initiation, Faithful, Hermit of Mink Hollow, Healing, The Ever Popular Tortured Artist Effect and Nearly Human. Utopia’s albums include Todd Rundgren’s Utopia, Ra, Oops! Wrong Planet, Adventures in Utopia, Deface the Music, Utopia and Oblivion. In addition to his work as an artist, Rundgren has also been a successful record producer who has produced classic albums for other artists. Most notably, he produced Meat Loaf’s Bat Out of Hell album, which become one of the best-selling albums of all time (43 million sold). He also produced Grand Funk Railroad (their hit “We’re An American Band”), the New York Dolls first album, plus albums by Hall & Oates, Cheap Trick, Patti Smith, Badfinger, the Tubes, XTC, Bad Religion and the Psychedelic Furs. Here is our interview with Todd Rundgren. He discusses the Utopia reunion, his early classic albums, how he wrote some of his hit songs, and his record producing. DK: You’ve reunited with the other members of Utopia for the first time in 32 years. How did you, Kasim Sulton and Willie Wilcox decide to get back together? Todd Rundgren: Well, it wasn’t a thing where we all sat around a table and said, “Let’s do it.” It’s been afoot for years now…decades even, mostly at the behest of the fans. I know that the other guys in the band have probably entertained the idea of getting the band back together for fun or whatever, but I’ve always been pretty busy, so it was never high on my bucket list. But the fans never gave up pestering us about it, so we figured we would take one last stab at trying to get all of the necessary elements together. The members of Utopia discuss their reunion concert tour. We didn’t get all the original members back due to health reasons, but I think we did a pretty good job of recapturing what the band has attempted to do. And once we got the okay from our promoter, declaring that it was actually a financially-viable thing as well (laughs), that’s when we set about to schedule the tour and rehearsing and devising a show to go with it. DK: How’s the tour been going so far? Rundgren: It’s been going well…we’re actually near the end of the tour. We’ve had about seven weeks worth of dates and we had two weeks of rehearsal. So the whole thing is about two months, from the beginning of April until the first week of June. DK: Over the years, you’ve recorded many albums, either as a solo artist or with Utopia. So when you’ve written new songs and you’re ready to make a new album, how would you decide if you wanted it to be a solo work, or with a band? Rundgren: I tend to write different kind of material. The material I write would pretty much have an individual voice to it…my voice. When we write for Utopia, we’re trying to make sure that there are a couple other factors in there. One is that [the song] highlights the playing abilities of the band. You know, we are all players, and the history of the band is as much about our live performances as it was about our studio recordings. So we would write stuff that was something of a challenge to play and sing. The writing process was always more collaborative. So if I had a song idea that I felt was good for Utopia, I would set that aside, realizing that it would probably be merged with other musical pieces that the other guys in the band would come up with. Whereas on my own records, they’re entirely my own vision. DK: Early in your career, two of your biggest hits were “Hello It’s Me” and “I Saw The Light.” Can you talk about how you wrote those songs? Rundgren: “Hello It’s Me” was the first song that I ever wrote. Up to that point, I was a guitar player and I could sing backgrounds, but I was not a lead singer. So I wasn’t even writing a song for me to sing. But I had a set of chords that I nicked off of a Jimmy Smith record—he was a jazz organ player and he improvised a introduction to a song that I figured out the guitar equivalent of, and that became the basic chords. Then I wrote what I came to write about in almost every song, which was the relationship I had with a girl in high school, that lasted maybe a couple of weeks (laughs). But it became fuel for years and years…you know, heartbroken ballads and that sort of thing. So right after I formed (the group) the Nazz, I realized that I would have to start writing material, because that’s what bands did…after the Beatles, they wrote their own material. So I forced myself to sit down and find some words that rhymed, and write about a girl that I knew in high school. And that was my first song. After that, I started writing more guitar-oriented material, based on the other bands that influenced me. And I principally wrote for the Nazz (which featured lead vocals by Robert “Stewkey” Antoni). I didn’t write for me to sing until I got into Laura Nyro just before the Nazz’s second album, and that changed my whole philosophy about writing. I started writing songs that I wanted to sing myself. That broke the band up in a way, and at first I didn’t any prospects. I had no job, I had no band, and I did not have any confidence as a solo artist. So I got into record production and engineering with the Albert Grossman group (Grossman was Bob Dylan’s manager and formed Bearsville Records). Eventually, they gave me a budget just to do a vanity project of my own. That became my first solo album that was titled, Runt. I did another album after that called The Ballad of Todd Rundgren. By then, I had written so many songs that it became almost formulaic. So when it came to my third album Something/Anything? I realized that I wanted to make a poppy record, with really accessible songs and capitalize on what I had learned about songwriting. So I sat down to write “I Saw The Light” and it took me about 20 minutes from beginning to end to write the music and words. By the time I finished Something/Anything? I was writing all the time, and it turned into a double album before I knew it. And by the time I got to the end of it, I realized that I was writing out of a formula, and that a lot of the subject matter actually was imaginary in a sense. It was still about the relationship that I had in high school, but it wasn’t about what was really going on in my head. It took an album called A Wizard, A True Star for me to break out of the formula and start to using greater possibilities. Ever since then, I can write ballads, I can write rock songs, I can write for guitar or for orchestra. I can write for anything because I’ve unburdened myself of the idea that a song has to be a certain way, a certain length or about a certain subject. DK: Another hit you wrote is “Love Is The Answer,” which was first recorded by Utopia but became a hit when England Dan & John Ford Coley recorded it. How did you write this song, and did England Dan & John Ford Coley hear Utopia’s version and decide to cut it? Rundgren: I suppose that’s what happened, because we didn’t get any heads up about it being released. It just came out and started to catch on at radio. And we suddenly realized, “Well okay, we’re at least making some publishing (money)” (laughs). We couldn’t get a hit out of our own version, but it was satisfying to know that at least our material was getting heard by somebody. When I wrote the song, lyrically it hews more to the Utopia subject matter than to the typical, introspective stuff that I would usually keep for my own records. So in that sense, during the time I was writing it, I was pretty much aware that it would be on a Utopia record rather than my own (solo) record. DK: Back in the ‘70s, you were one of the first artists to play all the instruments on some of your solo albums. So when you were working on an album, how did you decide to play everything in the studio, versus recording with a band? Rundgren: Well, it wasn’t as if nobody had done that. Paul McCartney [played all the instruments] on his first solo album, that predates all my solo work. So it was just a question of me picking up other instruments and just learning enough to add that particular color to my productions. I never became [a skilled] saxophone player, but I learned to play enough saxophone to have little interludes and ensemble parts in my records without having to go hire somebody, write out charts and that sort of thing. I’ve never been able to read or write standard notation, and that was sort of the musical philosophy I’d inherited from the Beatles, because on their very first album Meet The Beatles, there’s a picture of them on the back, and underneath the picture it lists all the instruments that they touched during the course of making the record. And I suddenly realized that a band can be, or even an individual musician can be, the source of most of the sound that is on the record. That philosophy followed us through the Nazz and then on into my own records. And by the time I got to Something/Anything?, I’d had enough exposure to the drums that I felt confident that I could do the drumming on my own record. So it was kind of an exercise, and I didn’t do a lot of that after that. [Later on] I went back to using better drummers than I was on a lot of the material, and then especially as we got into doing Utopia records and some of the more psychedelic records of my own, drum machines became more available. We would do things like take the cover off the drum machine and start messing with the electronics inside to come up with more unusual patterns than were programmed into them already. So as time went on, the skills that I developed in playing the keyboard and other instruments became replaced by digital samplers that had the same sounds, but all you had to be was a keyboard player. So a lot of the skills that I developed playing other instruments like sax or flute or oboe or any of those other odd things, or even the drums…those skills have atrophied over time, mostly because it’s just so easy to reproduce those sounds using digital technology. DK: As a record producer, you’ve produced some classic albums, including Meat Loaf’s Bat Out Of Hell. Can you describe what it was like making that album, which because such a huge success? Rundgren: In my mind, that record was always a spoof of Bruce Springsteen. And I think subconsciously, it was that for Jim Steinman, although not necessarily for Meat Loaf. [It had] the overly long material and the arcane imagery and iconography of the ‘50s and that sort of thing. You know, here it was the late ‘70s when the album was recorded, and they’re still singing about switchblades and motorcycles, and so I viewed the whole thing as sort of a spoof. And fortunately, the rest of the world took it seriously (laughs), and it became one of the most successful records ever made. I enjoyed the ironies of the material. You know, Jim Steinman had been developing this concept for years, and it was pretty much all ready to go, including all of the funny ironies…the long shaggy dog stories and that sort of stuff that was part and parcel of that album. DK: You also produced two very different but classic albums: We’re an American Band by Grand Funk Railroad and the New York Dolls’ first album. How would you describe working with those bands? Rundgren: Well, there were certainly polar differences. Grand Funk Railroad…they were itinerant musicians—they had played with Bob Seger before they formed their own band. They were all well seasoned, experienced and had made records before. This was opposed to the New York Dolls, who had never been in the studio before, could barely play their instruments, but were kind of a harbinger of what would be the whole punk movement. I did the albums because there are challenges in them, obviously. But I do them because I think there’s something worthwhile there. You know, I always review the material before I make a commitment to do the record. And in both cases, the material represented something unique to the experience of those musicians. So that’s kind of what draws me in, and then I try to create the best setting for performing those songs.